As the drums beat louder and louder, signaling the countdown and the overwhelming crowd at Marlins Park hooted and hollered. This reaction was not for a baseball game though, but for a unique hurricane relief benefit concert. Superstars from around the world united Oct. 14 to raise money and show support for those affected by natural disasters in Puerto Rico, South Florida, the Caribbean and Mexico. “Somos Una Voz (We Are One Voice): Somos Live!” was was a concert and a telethon event based in Los Angeles and Miami. Stars not only performed at the Marlins Park, but in Los Angeles as well. Celebrities like like Selena Gomez and Vanessa Hudgens took to Instagram to showcase their participation in the calling efforts and to ask for support and help. At the Marlins Park, Marc Anthony, Jennifer Lopez and Alex Rodriguez organized and hosted the concert, raising in total $26 million by the end of the night through donations from celebrities, ticket sales and phone donations. All the proceeds will be donated to charities, including the American Red Cross, Feeding America, Habitat for Humanity International, Save the Children, UNICEF and United Way of Miami-Dade, to rush food, shelter and medicine to the affected areas. Jennifer Lopez herself donated $1 million for the relief in Puerto Rico and Daddy Yankee donated $100,000 to Feeding America and $100,000 to the Red Cross. Rafael Mendez Badui, a Puerto Rican student studying marketing at UM, said events like these make a difference because of how badly the people affected by the disasters need support. The three-hour telethon and concert featured performances and appearances by some of the hottest artists in the entertainment industry. Influential Latin artists, such as Alejandro Sanz, Daddy Yankee and Nicky Jam, took the stage as part of a stellar lineup in Miami. Other world-renowned artists, such as Demi Lovato, Bruno Mars, Maroon 5, Gwen Stefani, Stevie Wonder and Chris Martin of Coldplay, also made appearances in the soundstage in Los Angeles. In between performances, the jumbo screen showed a variety of clips of the devastation where all the disasters hit, shots of interviews with volunteers and videos of first-person stories from the victims of hurricanes Harvey, Irma, Maria and the Mexico earthquakes. After Jennifer Lopez’s vibrant performance of her classic hit, “Let’s Get Loud,” she gave a powerful speech in English and Spanish, addressing the crowd’s resilience and patience. When asked about the event, Paula Landrón, a Puerto Rican UM student studying psychology, said the efforts to help don’t end with the concert and must expand to include federal aid. After performing “Deja que te bese” duet with Marc Anthony, singer Alejandro Sanz spoke to the crowd about Puerto Rico and Mexico. 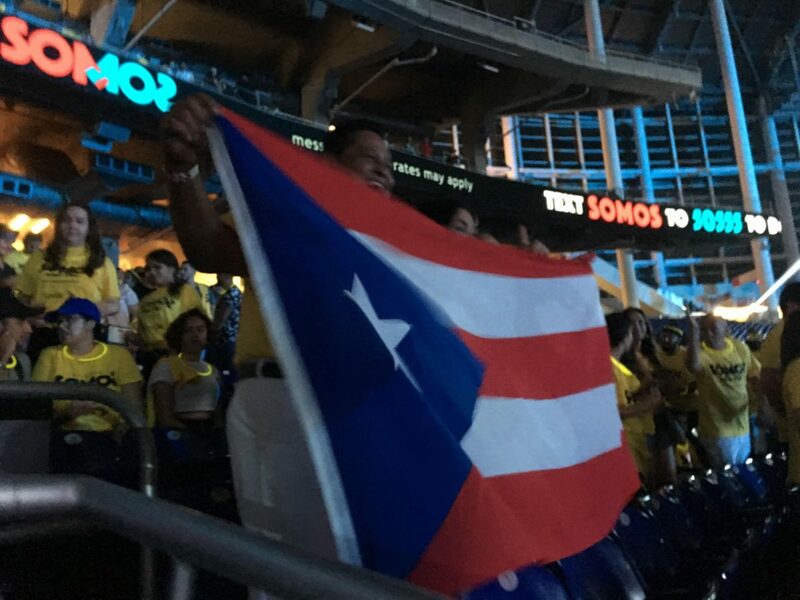 Marc Anthony ended the night with his song, “Preciosa,” which is dedicated to his homeland has become an anthem for Puerto Ricans all over the world, due to it’s lyrics. Anthony said his goodbyes to the rhythm of the drums, once again, cheering up the audience and inspiring attendees to take action.